Whether you need single doors or pairs, we can assist. 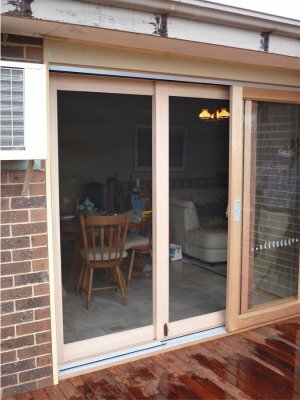 Just like all our other flyscreen doors, the sliding doors are usually designed and manufactured to match your existing doors. They can be installed either internally or externally. Maybe you have a pool and would like the door to be “self closing and latching” plus have a stronger mesh on it for reasons of compliance; we can assist with all aspects. We only use quality metal bodied wheels to ensure your door will roll smoothly for a long time and if you don’t have the tracks in place already, we can supply and install them too. And, as with most door applications, we recommend utilising the option of Light Stainless Steel mesh to provide the best protection possible from those little accidents.